Kit Kat is ready to find a new home after recovering from an awful collar injury. Kit Kat arrived at our shelter with a gash across her neck and chest; a shocking collar injury that was causing her unbearable pain. One of Kit Kat’s front legs had slid through her collar and become trapped, leaving the collar wrapped tightly around her neck and armpit. With every step she took, the collar cut deeper into her skin. 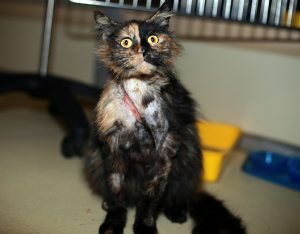 “Kit Kat’s collar wound was very large and very painful. 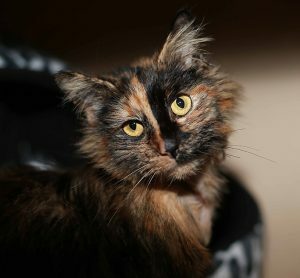 She was underweight and in a poor, dirty condition,” said Amanda, cattery coordinator at the Home. Kit Kat underwent surgery at our shelter hospital, with vets removing dead tissue and closing up the large wound. “This particular surgery can be very difficult and often have complications, such as a breakdown of the wound,” said Amanda. Following her surgery, Kit Kat spent a few days resting under the care of our vets and nurses, until she was well enough to go to a foster home. She spent five weeks in foster care to recover from her operation and ensure her wound didn’t breakdown and require further surgery. Kit Kat made a smooth recovery and enjoyed being spoilt with even more TLC from her foster carer. We don’t know how long Kit Kat had been suffering, but she received the life-saving treatment and care she needed. And that’s all thanks to the support of animal lovers like you. Your gift today can help provide treatment for a sick or injured homeless pet, just like Kit Kat. “Without care, it is likely that Kit Kat would have succumbed to infection and passed away. And, she would have been in pain the whole time,” said Amanda. 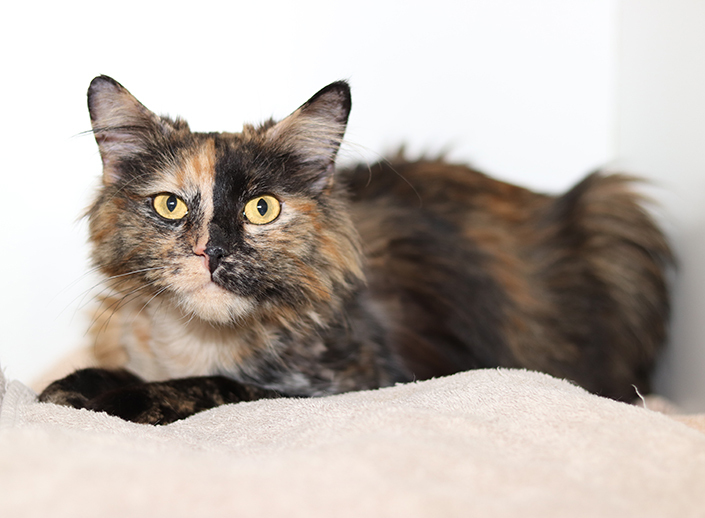 Kit Kat is now a happy, healthy cat ready to start a new life. If you can offer a loving forever home to this special girl, view her adoption profile or meet her at our North Melbourne shelter.